I would have surely spent much time browsing BG’s wasp photos trying to figure this one out. Thanks Ted. You wouldn’t believe how nice it is to post with wordpress after three months of hashing everything through moveable type. on July 7, 2010 at 8:09 am JasonC. Incidentally, was the bee chewing on the flower anthers, or was that damage done by something else? I never noticed that! I suspect the damage was done by something else. But, I don’t really know. 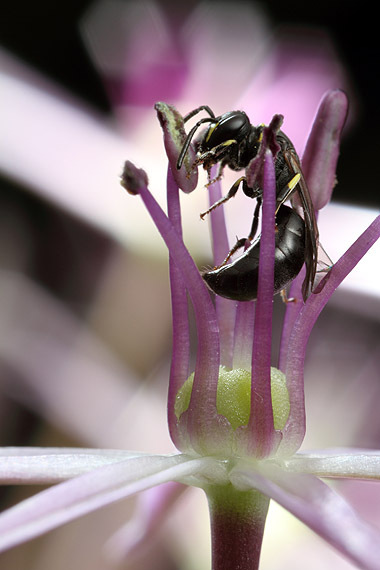 Hylaeus are interesting in that they carry pollen internally, rather than on external structures. Still, it seems more likely a soldier beetle or baby tettigoniid or ?? would have done that sort of extensive chewing on the anthers. on July 7, 2010 at 8:37 pm Andrea J.
Amazing composition. And, wherever you end up, I’ll still be reading. I fully understand your original migration to Scienceblogs…. but I have to admit it is great to see some posts back over here again! The advertising at SB is a little irritating – i constantly feel pressure to try and ‘Get ripped in only 4 weeks’! I also would have been searching the wasps looking for this chap! And regarding the comments on possible changes for your quizzes.. for what it’s worth my favourite ones have been the more obscure, where everyone has a few random guesses (the egg cases and foot micrograph were great!). Are you going to be back at scienceblogs now that the Pepsi controversy has some resolution? I want to know whether to update my RSS reader 🙂 Love the blog. I’m thinking it over, but may take a few more days to decide. As you might imagine there are more issues at scienceblogs than just the Pepsi incident. Now that Scienceblogs is faced with a large exodus I am waiting for Seed’s response to some of the other issues before deciding where to park the blog.